Congratulations! Contact me with your address, and I will send your gift card! For Day 9, Lori with Tags-N-Such has a $30 gift certificate for you!!!!! Tags-n-Such is your destination for personalized, hand crafted gifts for all occasions. They specialize in unique gifts that always leave a lasting impression. collegiate wine charms, key chains, note cards and more. 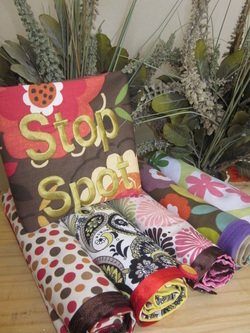 Lori also has a product called The Stop Spot. It is a portable "Time Out" solution for mommies on the go! Go check out all the cool things on her site!!! Like the Tags-N-Such Facebook page, too! I love wine charms, and Bottle stoppers and these would be useful for Christmas Eve, sitting in front of the Fireplace with my Bottle of Wine!! watching the kids open their 1 present(always pajamas).